In large hot skillet add EVOO. Heat on med-hi heat till shimmery~add onions and bell peppers. Saute' for 2 min or until soft. Remove skillet from heat. In large bowl break up beef; add eggs, soup or bechamel sauce, worcestershire sauce, bread crumbs, salt & pepper, and saute'd onion/bell pepper mixture. Work the ingredients together with your hands~if this freaks you out, wear disposable vinyl gloves. Do not over work mixture or it will be tough. Spray your pan w/cooking spray of choice. Form into 13"x9" pan, leaving a 2" gap between meat and pan on all sides. Place on middle rack in oven. Bake for 1hr & 30minutes if using metal pan; bake 1hr & 10minutes if using non-stick or glass pan. 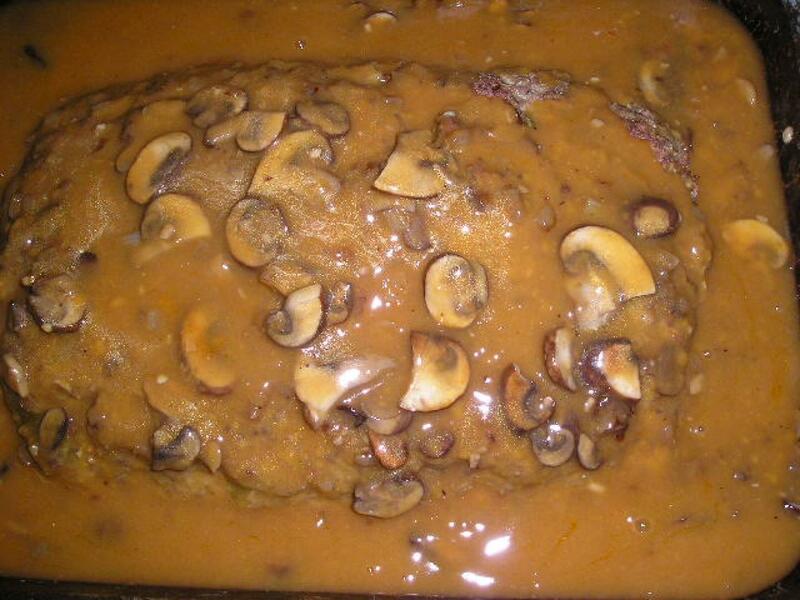 While baking meatloaf, prepare gravy. In hot skillet, on med-hi, heat EVOO till shimmery. Add onions and saute' for 1&1/2 minutes or until translucent. Add garlic and mushrooms and saute' until mixture becomes brown and dry. Remove from heat. In large bowl pour in Golden Mushroom Soup and slowly add stock or broth , whisking all the while till smooth. Now stir into mushroom mixture in the skillet and s&p. Set aside. About 10 minutes before meatloaf is done, put gravy on med-hi heat till it comes to a slow boil. Remove from heat. Take meatloaf out of oven and drain if there is fat in the baking pan. Pour hot gravy over meatloaf. Return to oven 10-15 minutes. Serve with mashed potatoes and veggies of choice.